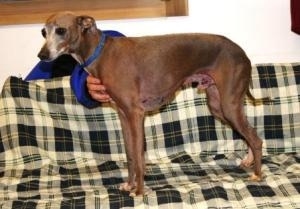 Ramsey - Diamond in the Ruff Rescue & Rehab, Inc.
Ramsey is an an Italian Greyhound who had lumps on his chest and stomach, requiring extensive surgery to have them removed. It is speculated that he also had prolonged sun exposure due to the line of sunburn running down his spine. His mommy was disabled and could not afford the surgery for him. We agreed to assume the financial cost for his surgery, so his mommy agreed to surrender Ramsey. After raising $895 from the public, we removed his tumors and had them biopsied, to reveal that they were cancerous. However, the vet was able to remove all of the cancerous cells, and he hasn't relapsed. Ramsey has been adopted and is now living in his forever home!